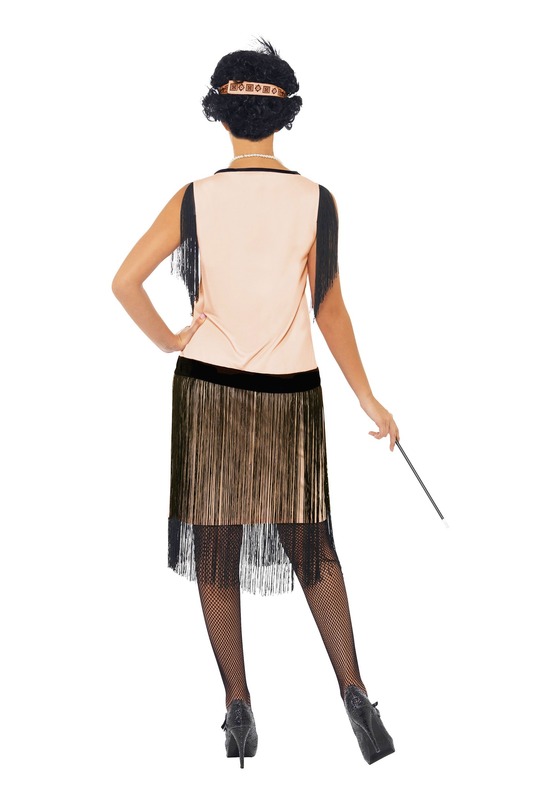 Get ready for a night on the town with this Coco Flapper costume! They sure knew how to throw a party in the 20s! Maybe it was the clandestine nature of the speakeasies or the unique fashion and music, but no matter the reason, everyone was out to have a good time. This Women's 1920s Coco Flapper Costume is a dress Daisy Buchanan would be proud to wear to any party in West Egg! It's inspired by designs of Coco Chanel, and includes two brooches. Pin one on the waistband of the dress and the other on the headband for a classic look! Don’t leave home before your next party without putting on this stylish costume. 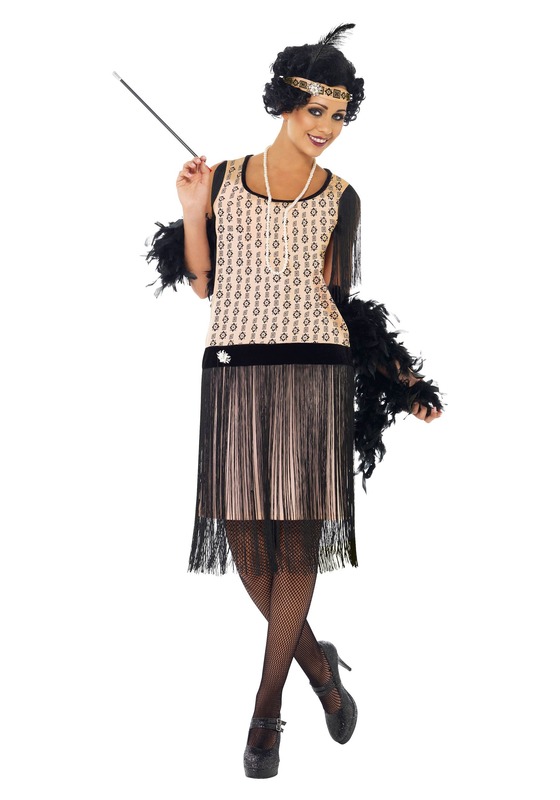 The flapper costume comes with everything you need for a night at the speakeasy. The costume starts with a pink drop-waist pullover tank dress that has a black velvet waistband and neckline. Long fringe hangs from the arms and gives the appearance of sleeves. The bodice of the dress has a black geometric Art Deco print and the skirt is covered with long black fringe that hangs from the waistband. The costume also includes a matching headband that fastens with Velcro for a comfortable fit. Top it all off with the 13” long black plastic cigarette holder. Add a pair of flapper shoes and a feather boa to complete your classy costume! Maybe even find yourself a gangster to go out with you - things are always more fun in pairs! I was concerned about whether this would be worth the price, I was very happy when the dress arrived! I'm ready for the party ! Don't hesitate to order, you get your money's worth ! Exactly what i wanted. Measurements were spot on and looks just like the picture. Delivered very promptly all the way to New Zealand. I would highly recommend Halloween Costumes. I bought this costume for a friend and she loved it. Finally a costume that isn't too short. Not all of us are young, skinny girls who like costumes with as little as possible. The large was accurately sized. Accessories were great. Good material. Flattering. Good value. The overlook is cute but the fringe fell off when I took the dress out of the package and it continued to fall off the dress when I walked in it. I needed something for a New Years Speakeasy Party. Looked Great & Very Comfortable.